If you live in North America and intend on picking up a brand new Switch or 3DS this holiday season, how about some digital games to go with it? 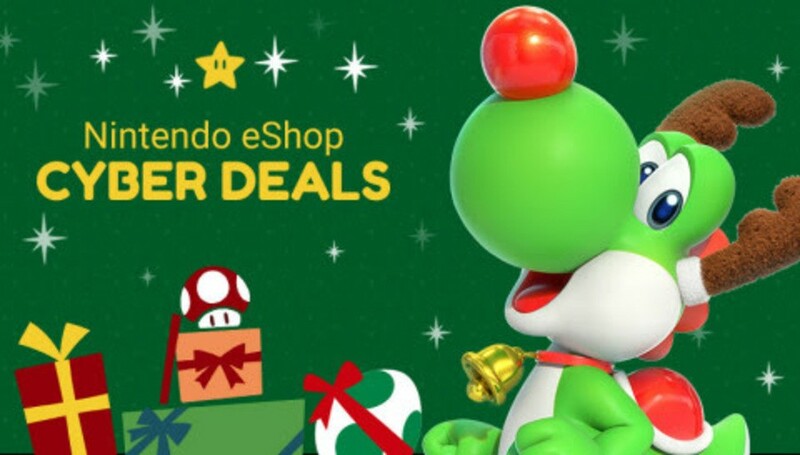 From now until 28th November, the Nintendo eShop cyber deals promotion is offering up to 50 percent off a selection of games. You can grab CELESTE for 20 percent off or team up with Starfox in Starlink: Battle for Atlas, which is now 25 percent off its regular price. On the 3DS front Ocarina of Time is 30 percent off and Shovel Knight is down by 20. Take a look at all of these discounts below. I might go and get Hyrule Warriors on the 2DS just for kicks. To see how bad it is on non new models. Of course, then again, there's better things to do with my money. I also learned that I should have held off on most of my Ubisoft purchases until now. Lesson learned for next year. Well I'll be, these are actually pretty good. I've been debating about Radiant Historia for some time now, but I might just get that physical. Yeah, some really nice deals and I like how it runs for a week. I'll be getting Starlink physically, but Crash, VC4 and Shining Resonance among others are looking very tempting at those prices. Wolfenstein 2,LA.Noire and Valkyria Chronicles 4 are all very tempting with 50% off. The problem is storage, all 3 would take up nearly 50gb . Was super excited about 50% off Snipperclips until I realized it's for the base game and not the bundle with the DLC. If you want the full package, it's really only 33% off. A bit shady there, in my opinion. Still not a bad deal, and I will probably pick it up. Someone let me know if Wolfenstein is on sale in Canada, because some of these are also physical, but not until tomorrow. Crap, I just got Dragon Quest VII with a MyNintendo reward. I needed to spend gold coins on something, and I figured it would be a while before that game would see any other sale. Could have saved eight bucks. But at least I can jump into some other games. I was expecting 5 or 6 titles, and was pretty surprised at how far down I had to scroll through the page to get to the bottom. This is a damn hefty sale. I had my eyes in Bloodstained for a while, so I went ahead and grabbed it. I may come back and pick up Hyper Light Drifter, or maybe double dip and get some of my 3DS games on the Switch. I sure wish Fatal Frame would go on sale someday. For once a great collection of games on sale! Awesome! Just picked up Tropical Freeze. Waited for a sale on that one - seemed a long time! VC4 is 50% off?! Man I should have waited! @Heavyarms55 you can still get VC1 25% off if you haven't gotten it, i'm repeating myself but i still think it's weird how that discount isn't on the page. People, there are way more discounts on the eShop than what these lists show. Go check them out for yourself really. It's not often that Nintendo's online stores have sales of this magnitude, it's looking like the PSN up in there. My wallet is crying... think I’m going pick up Undertale, Bastion, and Stick of Truth. There are some very good sales though! @Rohanrocks88 those deals really caught me by surprise. It hurts now that I payed full price for my double dip into Skyrim and now it's 50% off. I want to get Wolfenstein too but I filled up my SD card and there's nothing more I can archive lol. I had a lot of fun with rabbids it's a great game. Picked up the Stick of Truth, but I’m pretty sure I’m far from finished. Undertale, Hyper Light Drifter, The Messenger, Celeste and perhaps West of Loathing and Bastion will probably been getting scooped up too before this sale ends. @ancientlii Ohhh good to know! I will have to pick that up! Hope for a Europe sale as well. Only to a few indies so far? @Skalgrim Arbitrage is your friend. Fifa at 40% discount? Thank you very much! Any chance we’ll see any of these in the UK? There are loads here that are on my wishlist! Can we have these in Europe too? Please, PUHLEASE let that Wolf2 deal come to the European eShop! @ancientlii do you have VC4 yourself, though? If yes, you may be seeing the general discount granted to VC4 buyers. Grabbing that Final Fantasy XV: Pocket Edition HD, Celeste and Towerfall. @vitelus boo. Do you know why? @Roarsome I'd imagine they'd be there later on today's refresh if they are going to do the sale in the UK. However, you can make a separate US account and grab some cheap credit from various places. Sometimes works out cheaper than the UK store. Ran straight to my Switch and picked up Hyper Light Drifter, Celeste, Snipper Clips and The Messenger. What a windfall for me. So glad I held off on those till now. Seriously considering Skyrim. I love BotW and everyone says Skyrim is an incredible open world RPG but I’m worried it won’t have the sheer fun factor of Zelda, that it’s a much more serious game. I need both a pay raise and cut down on working hours at this rate. Catch 22. Wolfenstein, DK, HLD, South Park and Child of light for sure at these prices. Maybe Celeste and Towerfall too. Getting a Etrian odyssey for the 3DS also. Hope these all come to the UK eShop too. Wolfenstein, Skyrim, LA Noire and DOOM all at 50% off is awesome as I've put off buying any of those up until now. @ancientlii holy crap that's cheap! Waiting to see what other regions sales are but there’s a few there I want at good prices-DKC, both Valkyria Chronicles, The Messenger, LA Noire, and Okami. FAO anyone who wants these but isn’t in the US. Set up a US Account. Buy some US Gift Cards from PCGamesupply or Amazon US. @Samasaurus That's mental - cheers! Not a bad selection on sale, hopefully the EU sale is similar. L.A Noire is $9.99 in some U.S stores right now, and Mario & Rabbits is only $20 as well. I'll be getting a call from the credit card company about foreign transactions soon. Going to finally pick up Doom, Wolfenstein 2, and INSIDE. Been wanting to get all three for awhile now and this sale is too good of a deal to pass up. God of war on ps4 for 27$ was my first choice. I'll surely let myself be tempted by some switch bargain too. @nhSnork oh... well thanks for clearing that up for me. yep just got VC4 and thought "darn could've gotten the 1st of the series instead"
Smash preorder may have to wait a bit longer. Doom is half off. Hyrule Warriors Legends for me, thanks! Just the sale I was waiting for, as that makes the entire game with all DLC cost less than it currently retails without DLC, and at least $25 less combined than the Switch "Definitive Edition", which probably won't see a similar markdown for a very long time. There’s a few new games added to the “great deals” section. Think I’ll grab Lego Harry Potter for $25. Were any eshop cards on sale anywhere?